Tata Motors will soon launch the new top-spec variant- Tiago XZ+ to its Tiago line-up. The first image of production-spec has been leaked online just before the launch. The shade of the Tiago XZ+ will be new Etna orange paint wich made its premiere on the Nexon compact SUV. With the contrast roof, it will also come in Titanium Grey shade. Tiago XZ+ with the same color was spied in Pune. From Tigor petrol, the XZ+ gets 15-inch alloy wheels, the grille and projector headlights. On the side, there will be mere upgrades to the interior and a 7.0-inch touchscreen full with Android Auto and Apple CarPlay. It also gets power-folding wing mirrors and climate control. The model will be sold with the 85hp, 1.2-litre petrol and the 70hp, 1.05-litre diesel powertrain and both the powertrains are coupled to a five-speed manual gearbox. 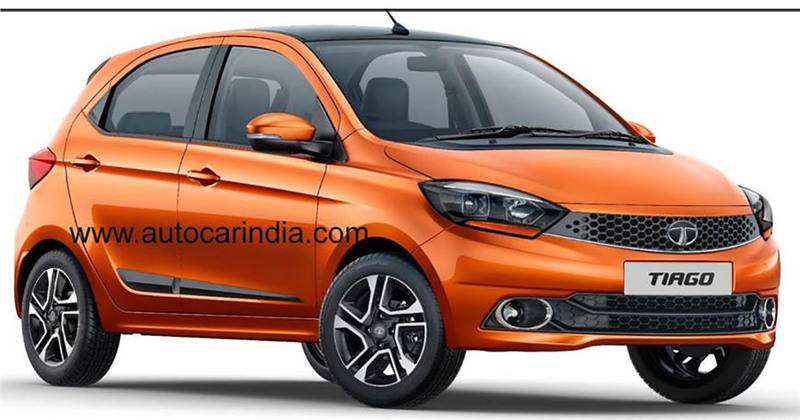 It is not yet revealed that whether Tata will give an AMT gearbox on the Tiago XZ+ or not. Mostly the Tiago XZ+ will cost approx. Rs 5.7 lakh (ex-showroom) which is same as of Santro Asta variant that comes with 69hh and 1.1-litre engine.